The great Melbourne-Tassie-Melbourne holiday finally happened a week or so ago, after being in the pipeline for several months. The aim of the trip was to catch up with a bunch of friends, visit the block of land in Waratah, and generally chill out and do some sight-seeing. We spent two weekends in Melbourne, with the Tassie adventure during the week between them. I love Melbourne. Something about that city really resonates with me. Even when the weather is awful and unpredictable. First weekend was hot and dry, the second weekend we got drenched with rain. One of Melbourne's attractions is that it currently is the place of residence of many of our friends. We managed to catch up with Sam & Belle, Dan & Jen, Miss Bethany and, of course, Dr Krys. There was much shopping, well perusing to be more accurate. I was reasonably restrained in my purchasing. On the first Saturday, we went to the Melbourne Theatre Company garage sale with Dan & Jen. It opened at 9am and we arrived at 9:30am, by which time there was a line about 150m long. So we lined up anyway. By the time we got in, most of the "good stuff" had gone. We saw people coming out earlier with huge boxes of stuff. Still it was an interesting browse. Sunday I went to the North Melbourne market day with Ms Belle. This was hosted by Thread Den, who I have previously visited and love their stuff. There was lots of vintage and vintagesque stuff and lots of crafts ware. I have recently become enamoured of this apron. While I have searched in vain for an Australian stockist, many of my friends have suggested I simply make one myself. I have pleaded laziness and a general lack of sewing mojo as an excuse. Until I found this gorgeous fabric at the markets. It was listed as a cotton, though it has a very papery/crisp feel to it. Like something you'd use for table linen rather than clothes. Still, it will certainly do for an apron. I think there is about 2m, though it isn't very wide. 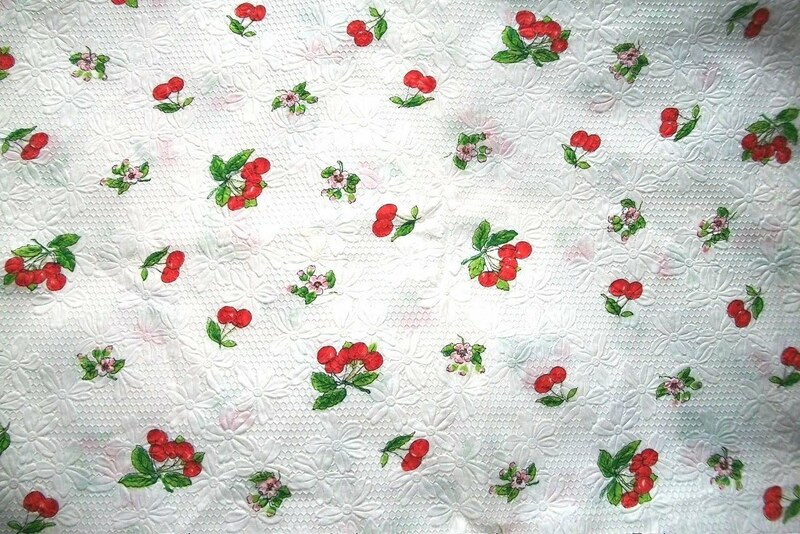 I will do a mock-up in some cheap fabric to see whether I will have enough. I also discovered that badges and brooches are very popular in Melbourne. There were lots of stalls selling cute badges, often covered with retro/vintage style fabrics. 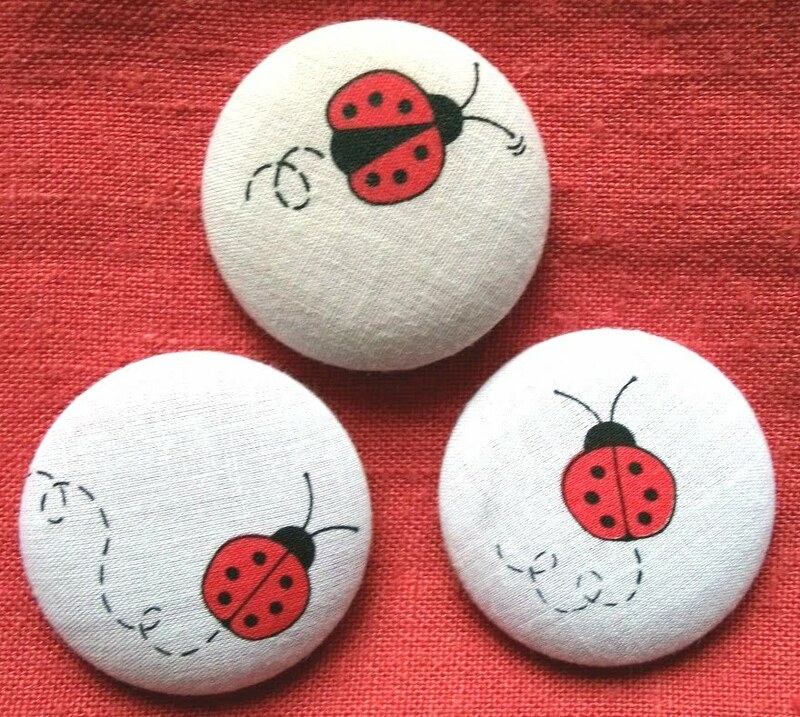 I picked up a set of three ladybug badges that were too cute to resist. I shall be sending one of them to Miss Bethany as I always think of her when I see ladybugs. There was much browsing of vintage patterns. Much bemoaning that many vintage patterns are in tiny sizes. And also some boggling at the fact that patterns from the 1980's are now considered "vintage" (the shoulder pads still beggar belief!). The Cunning Plans Dept went to Camberwell markets, but didn't end up getting anything (as opposed to last time when a box load of tools and bits got mailed home). The second weekend involved the great swimsuit mission. I've discovered that I cannot buy a swimsuit on my own. I've tried several times over the last few years without success. I need a good friend (or two or three), to get me into the store, make me try things on and provide objective opinions. Otherwise, the effort of trying to pick something to try on first, the effort of trying things on, and general fit issues will normally lead me to declare the whole thing hopeless and go home. Huge thanks to Ms Belle and Miss Bethany for being my swimsuit buying support crew. Their optimism, excellent taste and eye for good style were invaluable and lead to me buying the first swimsuit in over 10 years. There was also a DFO shopping expedition with Dr Krys (as it was raining and we decided that being indoors was a good thing). We successfully found a couple of simple thin strap camis for me (to act as modesty panels under v-neck tops) and a stack of manchester for Dr Krys. And it wouldn't be a trip to Melbourne without much fine coffee and dining. I love all the little hole-in-the-wall cafes and restaurants in Melbourne. I love the generally relaxed atmosphere. It doesn't seem as insane and frenetic as Sydney.